Will H. Carroll, 78, a former deputy chief of the international law division of the Air Force Judge Advocate General's Office who lived in the Washington area since 1949, died of cardiac arrest April 11, 1999 at Inova Fairfax Hospital in Virginia. Mr. Carroll worked 41 years for the Office of Judge Advocate General before retiring in 1991. Most of that time was spent in the international law division, where he was instrumental in helping to resolve some high profile cases and treaties for the Air Force. Mr. Carroll also was active in Fairfax City government, serving as chairman of the Fairfax City School Board and as a member of the Fairfax City Planning Commission and the Architecture Review Commission. In 1995, he received the gubernatorial appointment of Escheator for Fairfax. He was born in West Blocton, Alabama. After serving as a Navy fighter pilot during World War II, he received an undergraduate degree and a law degree from the University of Alabama. 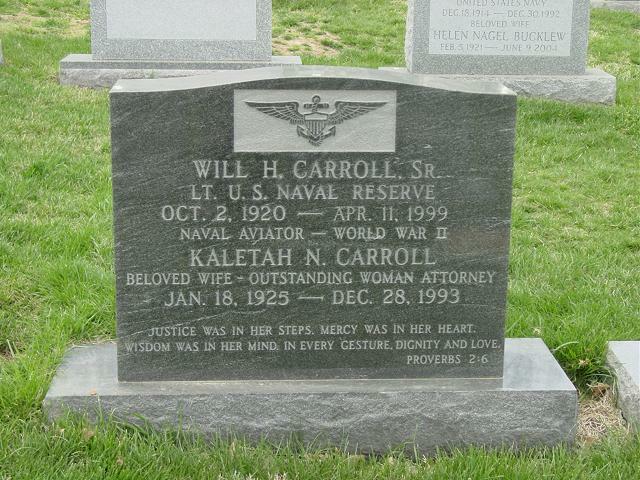 His wife, Kaletah N. Carroll, died in 1993 and a son, Will H. Carroll Jr., died in 1979. Survivors include two sons, J. David Carroll of Richmond and Dr. Brian H. Carroll of Fairfax; two sisters; and five grandchildren. On Sunday, April 11, 1999, at Fairfax Hospital, WILL H. CARROLL of Fairfax, VA. Beloved husband of the late Kaletah N. Carroll; father of John David, Brian Hurd, and the late Will Herman Carroll Jr.; brother of Nelda Harrison and Kate Gilbert. Also survived by five grandchildren, Will, Katherine, Daniel, Benjamin and John. Funeral services will be held Wednesday,April 28, 1999, 9 a.m. at Ft.Myer Post Chapel with full military honors. Interment Arlington National Cemetery. In lieu of flowers, memorial contributions may be made to one of your following choices: The Kaletah and Will Carroll Memorial Fund c/o Fairfax Public Law Library, Rm 308, 4110 Chain Bridge Rd., Fairfax, VA 22030; VRF-1 Reunion Fund, (Note on check: Will Carroll Fund), PO Box 425, Corpus Christi, TX 78403 or Blocton Third Baptist Church, Rte. 2, Box 238, W. Blocton, AL 35184.